Teflon's Motherless Child album is on the top 100 of the iTunes chart in the United States with a strong showing at #36. The album, produced by Tads Records Inc, is the artiste's highly anticipated debut album which will give him a major foothold in the European market where some entertainment writers regard him as the 'most exciting reggae-dancehall act to have emerged in the last five years". Teflon is slated to perform alongside Tessanne Chin & Erup for the last show of the Soul Rebelion concert at jungle night club Negril on April 11. The show will be covered by BETJ, Fader & Billboard Magazine. Soul Rebelion is an annual charity spring break event, which its proceeds repairs depressed schools in the Western parishes. It addition to help repairing schools, the event helps artiste to cross over in the US urban market. Teflon will be shooting the video for his new single "may be long", the song is produced by "yard-a-love records. "Loving time" single done by Stevie Face feat. 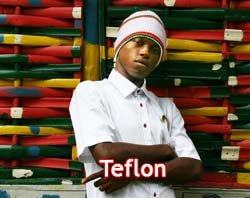 Teflon is getting rave reviews in U.K., New York and other Jamaican diaspora.